I began the Tour de Fleece with a rolling start this weekend. I’m not smitten with this fiber. It reminds me of trying to get a really bad knot out of my hair. I’m not sure what’s up. I’ve tried spinning from both ends of the roving and it doesn’t make a difference. 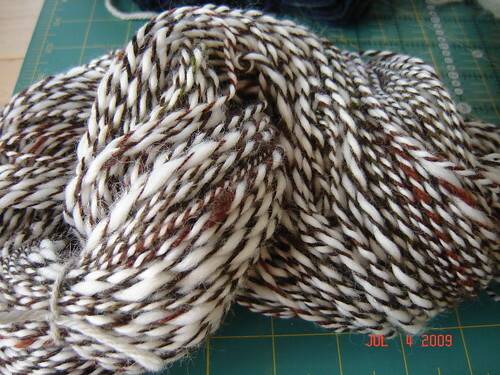 I picked this up a few years ago, and the other fiber I’ve gotten from this seller has been lovely. This fiber is a bit coarse, long staple length but then has all this short stuff mixed in. Not enjoyable so far, but the color is pretty. 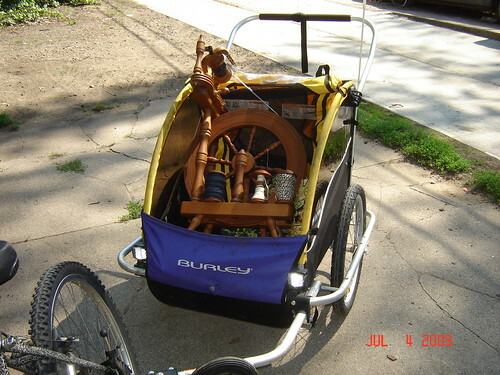 I took my wheel for a ride and went to my spinning group at the Fiber Studio. (Psst, Pam’s having a sale!! )I thought taking my wheel for a bike ride was a fitting way to start the tour. While I was there, I finished up this blue, sparkley fluff that I picked up at Ewetopia. Going by my plan to try different techniques, this was meant to be a singles yarn. But as you can tell by that pile of spaghetti it’s a little, shall we say… energized. I may have to find something else to ply it with but I’m not sure what. 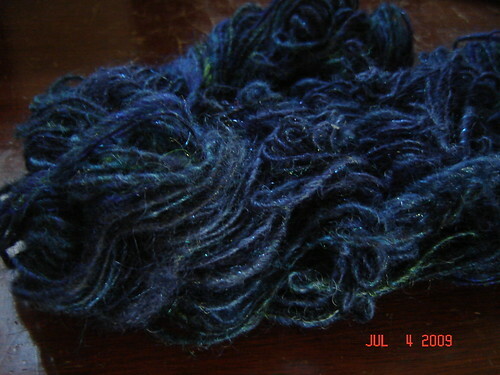 Plus, despite the absolutely gorgeous color (I wish my photo was better) it is a pretty coarse yarn. Not good for the neck or head. So I’ve got to think about this one. Lastly, I finished up the mix of Spinner’s Web Promethean and Punta that I plied together. I’m so, so in love with this yarn. It will be a sweater for Spinner for his birthday, not sure on the pattern yet. I’m open for suggestions! I have two big skeins of this yarn and for the first time I spun what I had planned on, with a project in mind. It’s a worsted weight. Both of the above skeins are soaking and drying right now. I’m quite on track with my Tour goal of spin as much as I can, with as many techniques as I can. Oh, and take notes! Sorry I missed Spinning Group at the Studio this month! Your work looks lovely though!!! I luv your blog !!! Love that blue yarn – absolutely shiny! Ha! I love the wheel on a bike ride. It’s the 5th wheel. I loved that you gave your wheel a little ride on the bike! The yarn you spun for a sweater for Spinner is awesome! Look forward to seeing that all knit up. Have you seen the EZ Snail Hat KAL on Ravelry? They recommend using handspun! 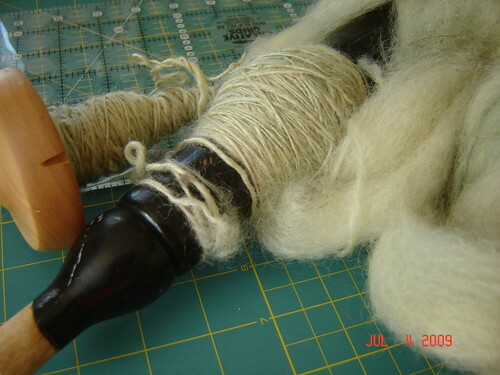 I started spinning again and if I have any sort of photo/laptop access by the end of the week – hmm. Very clever transport of the wheel!